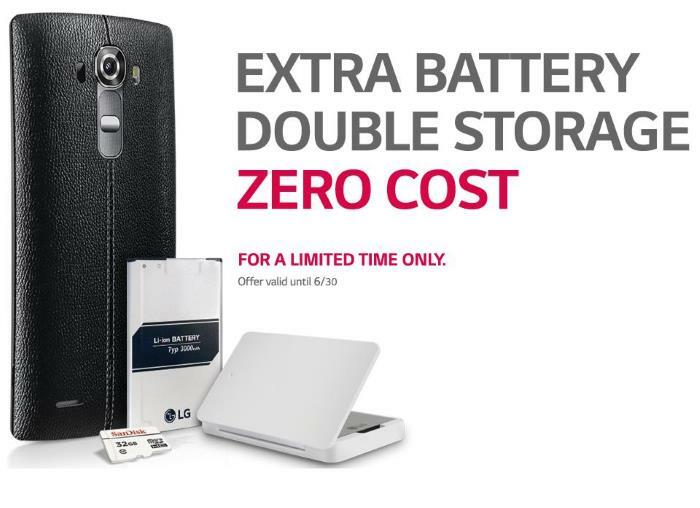 LG started offering a spare battery and microSD card as a promotion for those purchasing the LG G4. This is definitely an excellent offer for power users who run out of battery on the go so a spare battery will be a life saver in those situations. The promotion was set to expire on June 21st, but the company has decided to extend the promotion until June 30th. Do note this promotion is only for those residing in the United States. LG G4 comes with a massive 3,000 mAh battery, and now with an extra 3,000 mAh one as a backup, I’m pretty sure LG G4 users don’t have to worry about running out of juice any time. As a quick recap, the LG G4 comes with a 5.5-inch display sporting a resolution of 2,560 by 1,440 pixels, a Qualcomm Snapdragon 808 processor paired with 3GB of RAM and 32GB of internal storage on board. There’s a 16MP camera for photos and videos with optical image stabilization, a 5MP front-facing camera and ships with Android 5.0 Lollipop as its operating system. LG has now released their new G5 smartphone, have a look at our guide on the LG G5 vs LG G4, for full details on LG’s new flagship.